Last weekend, I went to Too Many Games in Oaks, Pennsylvania. I wrote about the 2011 edition, and there's not much more I can say other than I bought video games and saw Brental Floss perform, who is entertaining. 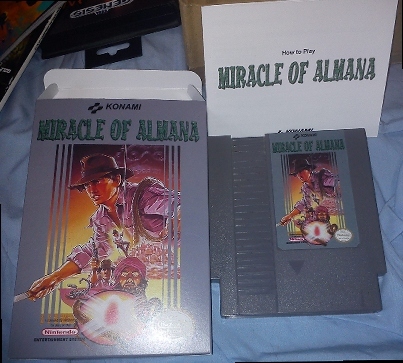 This post is actually about a special reproduction cart that was only being sold there - a cartridge version of Miracle of Almana. This is the English title for a game we've covered in the past, known under its original Japanese title of Almana no Kiseki. (Technically it's "Arumana no Kiseki", but that sounds silly.) It was only released for the Famicom Disk System in Japan around 1987 by Konami, but was passed over for US release. This was probably due to Nintendo's licensing restrictions forcing them to only release the cream of the crop, and Almana no Kiseki isn't terribly good. Yet it's a game I have a weakness for, mostly because it's such a transparent ripoff of Indiana Jones and the Temple of Doom, plus the soundtrack, provided by Castlevania's Kinuyo Yamashita, is excellent. And also because it's an early implementation of a grappling hook-style mechanic, even though here it's weird and doesn't really follow any semblance of sensible physics. It was $50, and I already own the FDS version, but I'm a sucker for Konami, so I went for it. Above is what was included in the package - they took the FDS art and remade it in the grey box fashion of Konami games from the era, made a new logo, and assembled a neat package. There's still some weird stuff about it, though. The cartridge was clearly reused from another game and wasn't exactly the cleanest. The cardboard has a different feel, as does the manual, which is, surprisingly, in color. 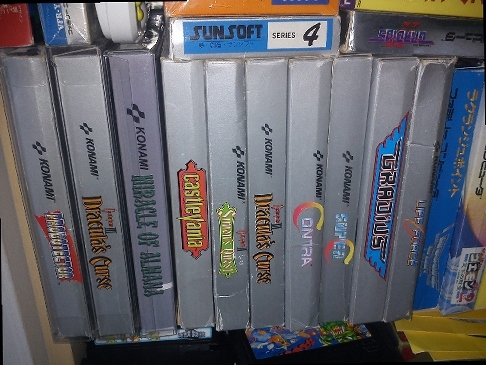 As you can see from the above shot, the color is SLIGHTLY off from other Konami games, although I'm not sure if that fading is due to age on the other boxes. It also came from a poster, a replication of a Japanese advertisement, though it was separate from the main packaging. I have mine rolled off somewhere, likely to be never found again. What I was most curious about it was actually playing it. Most reproductions like these are simply ROM dumps - translations or other hacks. 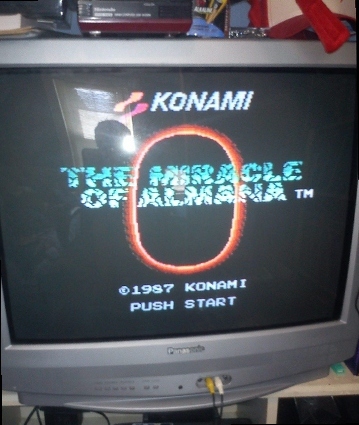 On the other hand, Miracle of Almana was originally a Famicom Disk System game, which means someone had to go through the trouble of getting it working on a cartridge. I'm actually really interested in how this was done - did it need to be hacked to use a memory mapper or something? Could any readers provide any answers? - but details on who actually did this seem to be scant. Anyway, there's no real text in the game other than the title screen, which is shown with a new logo in the above picture. There does seem to be a bit of glitchiness in the status bar whenever you switch weapons, that I don't recall being there originally, but the game itself was always kinda shoddily programmed anyway. The other thing I was concerned about is how it would transfer over the extra FM synth from the Disk System version, since they aren't supported on cartridges (or any non-Japanese Nintendo system, for that matter.) Normally the music would have to be reprogrammed to use one of the standard square or triangle wave channels, so how much effort would these hackers put into this reproduction? As it turns out, there wasn't any effort at all. The extra sound channels are simply missing with nothing to take their place. It might not sound too bad if you're not familiar with the original music, but it was pretty heartbreaking. It's neat to have around, I guess, though $50 is a bit much, even though that's about the going price for any old full packaging reproduction nowadays. It'll be good to have around for whenever the belt in my Twin Famicom goes, even though it's an inferior version. I saw some FDS to Famicom conversion in South Africa in the early 1990s, courtesy of Hong Kong/Taiwanese/Chinese hackers. There was definitely SMB2, aka The Lost Levels, which never officially had a cartridge release outside of the SNES remake, as far as I'm aware. I have always regretted passing it over for SMB3, since it would be fairly valuable today, I'd guess. I also saw a lot of NES to FC ports of NES exclusives. Ahh, gotta love the bootleg scene. Aw, the music is the best part. Too bad there's not an easier way to mod the NES to accept the sound... like, either let the cart itself have Aux out to mix in with the RCA jack, or have the mod plug and play via the expansion port. I wonder if the standard expansion port sound mod will make the extra channel audible? It works for roms on a PowerPak. Worth a shot. Damn I love this game, is it available anywhere online? It's a truly great game IMO, just as good as Jackal and even Castlevania IMO. If it had made it to the US it would be a classic, they likely didn't because of the potential lawsuits from Paramount. Is possible someday a article for Treasure of Usas for MSX2? This game is a Konami's rare gem! Sorry my english! I'm Brazilian! No, there is no way to hear the extra sound channel with this version. MMC1 does not have the extra sound channel hardware that was present in the FDS hardware. To actually hear it properly on a NES use the FDS version with a Power Pak and it works perfectly. To hear Konami VRC6, Namco, Sunsoft, and FDS extra sound with a PowerPak all you will need to do is a tiny mod of adding a single resistor to your NES, but it's quite easy to do. If you want it to have the complete experience with proper music AND have it translated into English with the level select feature, simply use the DvD Translations FDS translation with the PowerPak. This cart port was based on this translation. I'm the programmer/hacker that ported the game. I carefully examined the game to learn as much about how it functioned as I could. The Famicom Disk System is basically like having no memory mapper at all. It has a fixed amount of RAM and bigger games are made possible by loading data from the Disk. The hack involves reprogramming so instead of loading data from the Disk it loads data from the cartridge. About the sound expansion, while it would have been nice to have there was no way to reasonably achieve this. While in theory you could reprogram the sound engine and try to make up for its loss it would be a big job and still not sound like the original. The project was already big enough without worrying about the expansion sound. From playing the game personally I felt that many players probably would not notice the missing sound if they had not played the original extensively. You mentioned the status bar glitch, as well as effort put into this. Well it was considerable effort I put into porting the game. The issue with the status bar was a big deal actually. See the FDS while not having memory banking functions, it had the obvious sound expansion and disk interface hardware. And in the disk interface corner is an IRQ generator. Well this allowed the game to setup an interrupt to trigger right before the status bar would be drawn to set up the drawing parameters. For my port though I did not have this luxury. And to make things worse the MMC-3 mapper which has a Scanline based IRQ generator was not compatible as Almana "broke the rules" of using the MMC-3 IRQ counter. Discovering that was a serious blow to the project. It meant that the only suitable mappers were Sunsoft's FME-7 or the MMC-5. These were both bad options for the project as far as production goes. But I put in alot of effort and figured out a solution that seemed to work quite well for the status bar that did not require any IRQs. However there was the occasional status bar glitch when switching weapons I believe when you had alot of different weapons in your inventory. Considering other commercial games had far worse glitches (see TMNT1) I felt this was acceptable. I did the best that I could with the hardware I had. I really did put in effort. As for converting not being difficult, I certainly wouldn't agree with that. It really depends on which Disk System game you are talking about. Some games are programmed in a way that makes it easier than others. Keep in mind that bootleggers from the 80s and 90s had the ability to produce cartridges themselves and thus could design hardware that mimics the function of the FDS. There are FDS to Cart pirates that work like this. There was an Almana pirate cart but this release was not at all related to that as it used a custom pirate mapper. This was a port to the standard MMC-1 mapper. I could only tackle issues through software or existing hardware. If I could have designed and produced new hardware maybe the status bar wouldn't have been an issue and perhaps it would have even been possible to have the expansion sound. Actually I don't believe I did anything to stop the expansion sound from working so it's possible with a crazy adapter and a FDS RAM Adapter you could use it to hear the expansion sound in the NES port. Have fun wiring that up. Oh and the designer(s) and producer(s) of the packaging and manual put in a lot of effort too. Thanks for the reply! Things like this are fascinating to read. As for the "no effort" comment, that was aimed squarely at the music conversion. Purely from the standpoint of a hobbyist, if this ROM were being released for free, it would be totally understandable given the technical limitations. But as a commercial product, paying $50 for it and find it missing is somewhat disappointing, considering that it was pretty much the main reason I bought it. (I REALLY love the music in this game - it's one of the main reasons I bought a Twin Famicom, no joke.) Had the sound engine been rewritten to sound like, say, the difference between the FDS Gyruss and NES cart Gyruss, then it would've put it on the level of an official localization, which would have been extremely impressive. Eventually the ROM probably will be available for free. I don't know when that will be yet. But it will still cost someone money if they wish to put it into a cartridge. I'm not sure about the breakdown of costs but I'm sure that having the box and manuals and the posters made and included in the package were part of the higher cost. I would like to have a Twin Famicom myself but I can't bring myself to buy one yet. But since you already have one you should probably look into spare drive belts and be ready for when it needs to be replaced. The drive can almost always be repaired if you put the time into it. One thing that may help players that choose to get the cartridge version we've offered though is if you press buttons on player 2's controller you can access a couple of cheats. In the future we might see a more complete cartridge version that includes the FDS sound channel. Until then for the die hard fan you can always try the PowerPAK with the audio resistor mod. The PowerPAK is part of why I haven't bought a Disk System.